Although the abolition of Switzerland’s Lex Koller, a federal measure restricting property purchases by non-nationals, could have a sudden impact on property prices and development in the more popular resort areas of the country, the federal authorities have allowed the cantons and communes a three year grace period to get to grips with the new situation; effectively Lex Koller will not be completely dead until 2010 (also read Credit Suisse’s view on its abolition). Existing restrictions on foreign companies owning or developing property will remain in place but the government did appear to make an exception for Samih Sawiris’s resort development at Andermatt. There has been talk of a relaxation of the regime on property ownership by non-residents for the last two years and now the federal cabinet has decided to go ahead in setting it aside. The controls originally came into effect in 1961 as a way to prevent the country’s property market becoming completely distorted by foreign buyers. In 1972 a total restriction was put in place but was lifted two years later, although the controls became tougher than they had been to begin with. In 1984/5 controls of ownership by non-residents (even Swiss nationals) were introduced under the Lex Friedrich. The licensing system for foreigners to make property purchases is implemented by the individual cantons. Non-Swiss property investors will often have to wait for their licence, particularly where the property is new build or the area is very popular with holidaymakers. 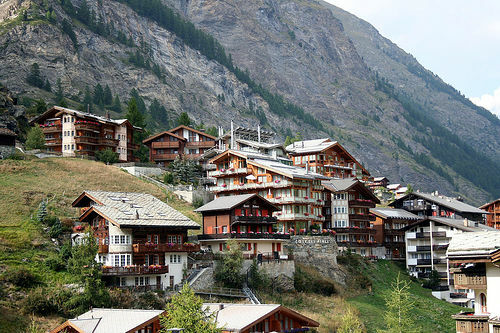 These delays are unlikely to go away once each canton is executing its own policies (read these articles from SwissInfo.org; (Foreigners banned from buying homes in Verbier & Property rules could get simpler for foreigners). For a full treatment of the subject with views on the protection of Switzerland’s environment, read Rolf Ribi (pdf). The AngloInfo site gives a good English language introduction to the subject of acquiring property in Switzerland and also has articles on residency in Switzerland and opening a bank account. For mortgages Swiss banks normally lend only 80% of a property’s purchase price. Note that some cantons have restrictions on how quickly foreigners can resell property and capital gains tax varies from one canton to another. Switzerland really does require thorough canton-specific research. The Bernese Oberland and Canton Vaud are the most popular among UK purchasers.